Dr. Blair is a Diplomate of the American Board of Urology. 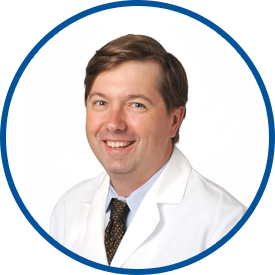 After graduating with a bachelor of science degree from Emory University in Atlanta, Dr. Blair went on to receive his medical degree at the Tulane School of Medicine in New Orleans. He completed his surgical internship at the National Naval Medical Center in Bethesda, MD, followed by his urology residency at the Naval Medical Center in Portsmouth, VA. He was a primary care provider in Okinawa, Japan and Quantico Marine Base and the FBI Academy in Virginia. Before joining Westmed Medical Group in June 2005, Dr. Blair enjoyed a busy urology practice in Portsmouth. He has taught, lectured and published research in the field of urology. Blair is affiliated with White Plains Hospital and Greenwich Hospital. Dr. Blair is a superb physician. Dr. Blair is a knowledgeable doctor, who shows great concern for his patients. He did a prostate procedure on me that made me feel 100% better. I would recommend Dr. Blair to anyone. As I stated earlier, Dr. Bryan Blair is THE MAN and among all my other physicians -- I LIKE HIM THE BEST. Please convey my comment to him. I do not give out compliments to professionals as I do not know if they will be accepted in the proper spirit. Thanks! Dr Blair showed genuine concern and followed through w a phone call to update me on my condition in a timely manner! Dr. Blair provided excellent service and care. Dr Blair is a very good provider,happy to have him. I have already recommended this team of providers to several friends and family members.